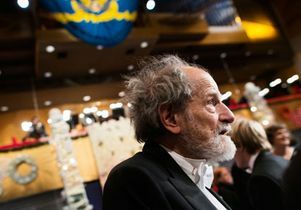 UCLA emeritus professor of economics Lloyd Shapley today accepted the award known officially as the Sveriges Riksbank Prize in Economic Sciences in Memory of Alfred Nobel. Professor Shapley shared the 2012 prize with Alvin E. Roth of Harvard. Professor Shapley received his Nobel diploma and medal from King Carl XVI Gustaf of Sweden at a ceremony in the Stockholm Concert Hall. Music was performed by the Royal Stockholm Philharmonic Orchestra. A banquet for the Nobel laureates and invited guests followed this evening at the Stockholm City Hall. "Professor Shapley: Your contributions to cooperative game theory are legendary among game theorists and economists. You and David Gale are the founders of matching theory, and the deferred-acceptance algorithm you discovered is the cornerstone on which theory and applications rest. "Professor Roth: Your innovative work comprises theory, empirical evaluation, laboratory experiments, and design of actual markets where prices cannot be used, for ethical or legal reasons. It is this feedback between theory and practice that makes market design such a flourishing field. "You have never worked together. But together your contributions constitute one of those unexpected journeys, from basic research motivated by sheer curiosity, to practical use for the benefit of mankind. 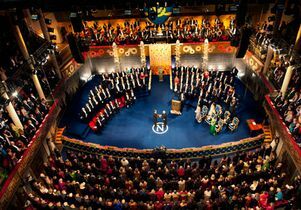 It is an honour and a privilege to convey to you, on behalf of the Royal Swedish Academy of Sciences, our warmest congratulations. I now ask you to receive your Prize from his Majesty the King." On the weekend, Professor Shapley delivered his prize lecture at Aula Magna, Stockholm University. He was introduced by Professor Tomas Sjöström of the Economic Sciences Prize Committee. 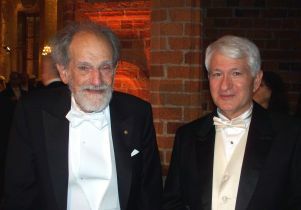 Professor Shapley's guests in Stockholm include his sons, Peter and Christopher, and their families; his sister, Mildred Matthews, and her four children; UCLA Chancellor Gene Block; and mathematician Guillermo Owen. 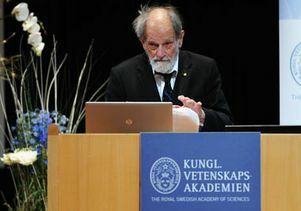 UCLA Professor Emeritus Lloyd Shapley delivers his Nobel prize lecture in Stockholm. 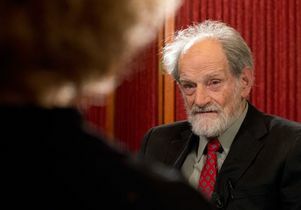 Emeritus professor Lloyd Shapley being interviewed in Stockholm, Sweden during a week of events for Nobel Prize winners. 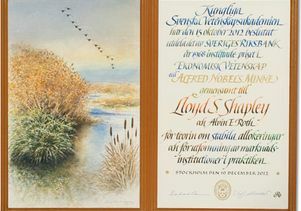 The Nobel diploma awarded to UCLA emeritus professor Lloyd Shapley in Stockholm, Dec. 10, 2012. 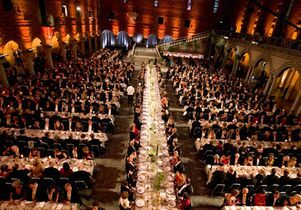 Overview of the banquet for Nobel laureates held in Stockholm on Dec. 10, 2012. 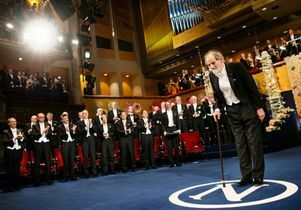 Professor emeritus Lloyd Shapley after receiving Nobel prize in economics at the Stockholm Concert Hall, Dec. 10, 2012. 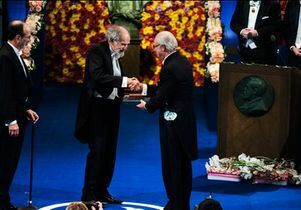 Professor emeritus Lloyd Shapley at the Nobel Prize ceremony in Stockholm. Dec. 10, 2012.